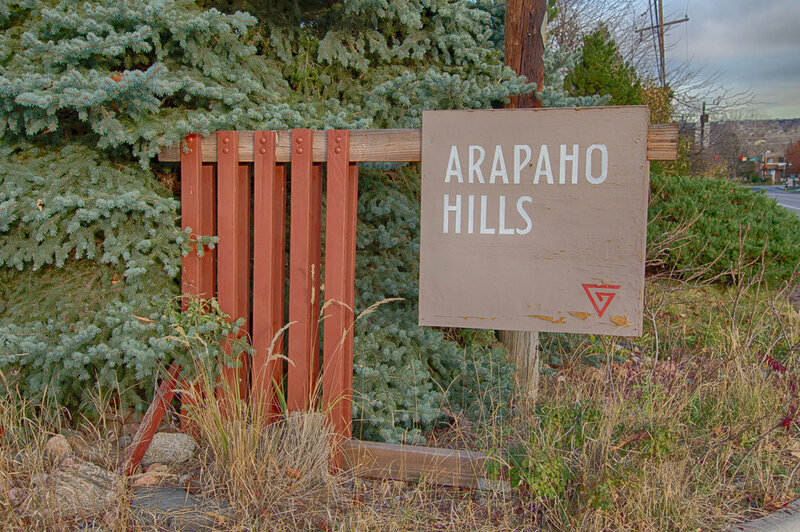 Welcome to historic Arapaho Hills in Littleton, the younger sister to well-known Arapahoe Acres in Englewood. 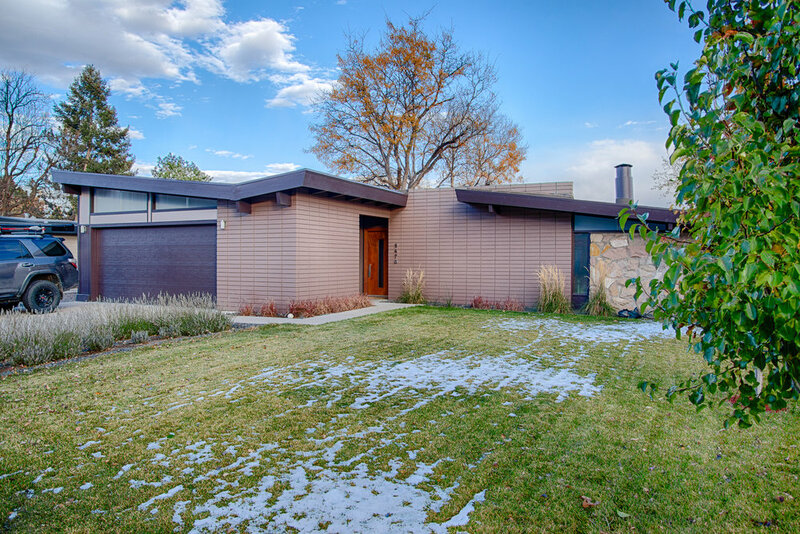 Spurred by the success of his Arapahoe Acres development, Edward Hawkins looked to develop another piece of land in Denver’s suburbs, continuing his approach of building high quality semi-custom/custom modern houses in a single enclave. Although Hawkins kicked off the development of Arapaho Hills, he retired early in the project, leaving it in the hands of business partner Clyde Mannon. 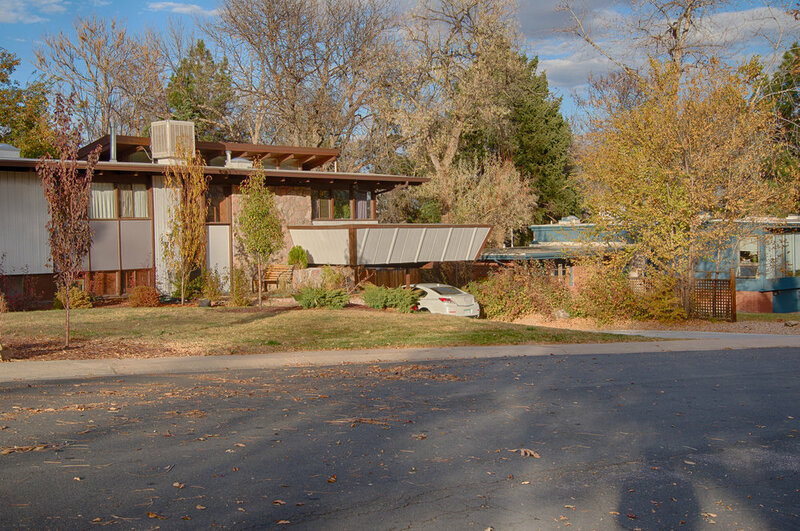 Although a few spec houses were built, most of the houses in Arapaho Hills were custom, and all houses were designed by Denver architect Bruce Sutherland. As the name suggests, the land for Arapaho Hills is on a steep incline. Sutherland designed houses that respond to the terrain, rather than ignoring it. Depending on what side of the street the houses were built on, they might have walk out basements, or a main level that sits high above the street with garages below. Like Arapahoe Acres, the influence of Eichler (a California developer whose houses were designed by highly talented modernist California architects) and Frank Lloyd Wright are prevalent throughout the neighborhood. The development of Arapaho Hills started at the bottom of the hill, along Lowell Boulevard, and worked up to the top, meaning that some of the neighborhood’s most spectacular houses are at the top of the hill. There are also two interesting monument signs for the neighborhood (one on Lowell, and one on Berry) as well as another monument of large letters spelling out Arapaho Hills along Lowell adjacent to a mid-century modern preschool building. Like its sister in Englewood, Arapaho Hills in not a protected historic district, but is listed on the National Register of Historic Places. 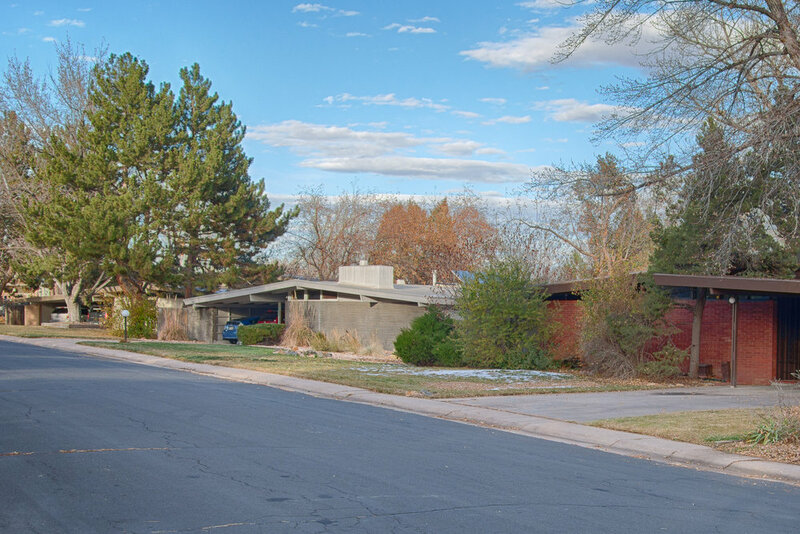 Fortunately, residents of Arapaho Hills recognize the value of preserving these exceptional houses, and with only a few exceptions, the houses in the neighborhood are in great condition, and have stayed true to their architectural roots. Arapaho Hills is located at the intersection of Lowell & Berry in Littleton. The neighborhood is listed on the National Register of Historic Places. Learn more about this neighborhood at the Arapaho Hills website.